(Newser) – A knife-wielding man stabbed three people, one fatally, in Australia's second-largest city on Friday in an attack police linked to terrorism. 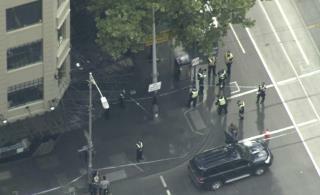 The attack during the afternoon rush hour brought central Melbourne to a standstill, reports the AP. Hundreds of people watched from behind barricades as police tried to apprehend the attacker, reportedly seen swinging a knife at two police officers in a video from the scene. Police said the man got out of a pickup truck, which then caught fire, and attacked three bystanders with a knife before being shot in the chest by an officer. The suspect died later at a hospital. A man in his 60s also died after being stabbed in the face, according to a witness, while the two others were hospitalized. Police said the attacker's vehicle contained several barbecue gas cylinders in the back. A bomb squad rendered them safe without any exploding. Victoria state police Commissioner Graham Ashton said the suspect, originally from Somalia, was known to police through relatives who "certainly are persons of interest to us." The incident is being treated as terrorism, Ashton told reporters, adding that the police counterterrorism command was working on the case, as well as homicide detectives. The attack—described by Victoria state Premier Daniel Andrews as "an evil and terrifying thing"—occurred on the eve of a busy weekend in Melbourne, with a major horse race set for Saturday and a national league soccer match the following day. Ashton said police were "doing security reassessments of these events in light of what's occurred," but there was "no ongoing threat we're currently aware of in relation to people surrounding this individual." I wonder how many would have died if he'd had access to a gun? Fortunately for them, Australia has sensible gun laws which make slaughters like the one in Thousand Oaks as rare as hen's teeth.